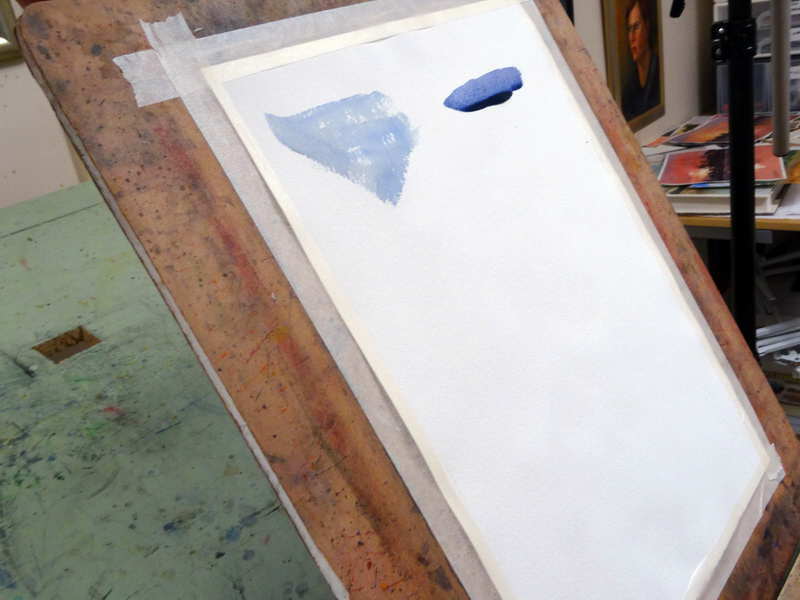 Before looking at question of easel angle in more detail let us first think about what happens on the surface of your watercolor painting. Also why we even need to talk about the easel’s angle. Angle of watercolor painting easels. Mine is usually at about 20 degrees. The most important ingredient in watercolor painting is water. Water flows faster or slower depending on the angle of the slope it is on. 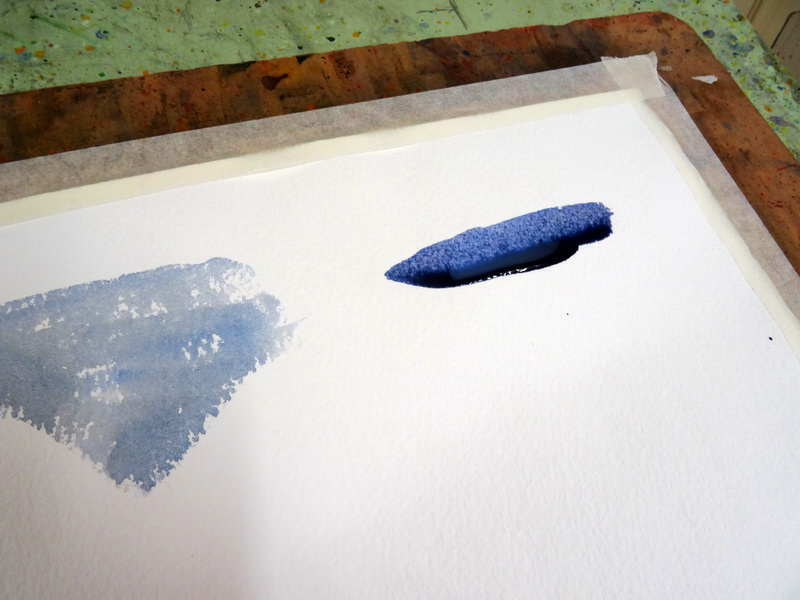 It also depends on how much water is on your watercolor paper, and the texture of your paper. It will flow faster on smooth paper and not so fast on rougher paper. If only a thin layer of water is on your paper then it will not flow very fast no matter what angle your board is set to. On the other hand if you have a lot of water on your paper then the steeper the angle the more your watercolors will flow. At a step angle a wet watercolor wash will drip but a not so wet one will not. For most of my regular watercolor paintings I just set my easel at between 20 and 30 degrees. It doesn’t make much difference to me. I find that for my own work this angle allows the watercolor paints to flow at just the right speed to give me nice clean washes. When I am painting plein air (outdoors) if the weather is cool I quite often use a more vertical angle so I can paint with less water. I do this so my work dries faster. If the weather is hotter I will use a flatter angle so I can have more water on my paper which will slow down the drying time. 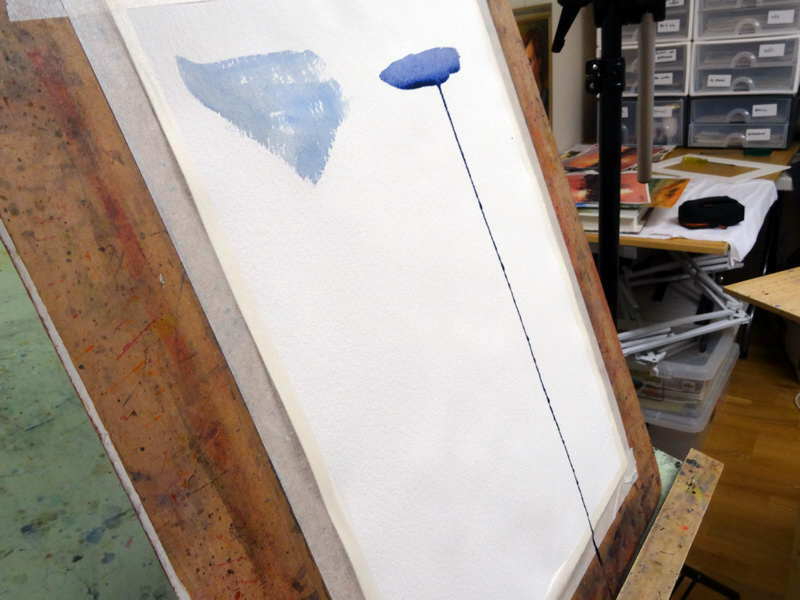 Some watercolor artists paint almost vertically because they like having dribbles of paint flow down their work. You can see an example of this in the image above. Other artists paint almost vertically because it is hard on their back when painting with the board in a more horizontal angle, especially when painting large works. In this case the artist will probably reduce the amount of water in their brush to stop the paint from running down the page too fast, if at all. On the left you can see that if you paint with a watercolor wash which is not too wet it will not run down the page no matter what the angle of your board is. However on the right you can see that the very wet wash is just about ready to drip! If I am doing a dramatic sky with warm colors but with bright highlights I will paint with my board completely horizontal. I do this because I will need to use lots of water but at the same time I don’t want all the watercolors to completely run into each other as I want to keep some soft highlights. Sometimes I will vary the angle of my board as I progress with a painting. I change the angle depending on the effect I am trying to produce at a particular stage in my watercolor painting. Once the flowing watercolors achieve a particular effect I am after I will often just lay my board flat to let it dry. Otherwise the paints would continue to flow and I would lose what I had created. Sometimes I will pick up my board and turn it diagonally to cause the watercolor paints to flow in a different direction. Hopefully the above will help you make up your own mind about, “What should the angle of watercolor painting easels be?” It is not a complete list but should be enough to help you understand the question and its answer. Certainly the more proficient you are with your watercolor painting then the steeper an angle you can paint at. As I have mentioned above the steeper the angle the less water you are likely to paint with, unless you want to see lots of paint dribbles running down your watercolor paper! I think you can see that there is no right or wrong angle for everyone or every painting situation. It depends on the artist and the watercolor painting he or she is painting at the time. By all means start with about 20 to 30 degrees when you first start your watercolor journey. With observation and experience you will see how you may need to change the angle of your easel to suit your particular needs. Thank you for sharing your watercolor tips,and techniques. It is very generous of you. I so enjoy my watercolor hobby. Slowly I am improving, wee bit better than a beginner after three years. 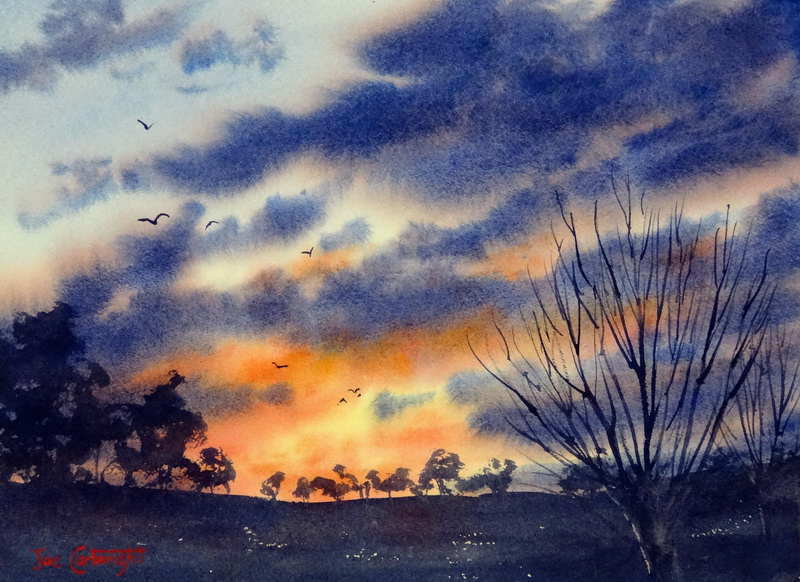 You are welcome Jackie, I am glad you find my website of use to your watercolor painting. How lovely that you share your knowledge and experience with us beginners, so that we can see the light at the end of the tunnel!! A big thankyou. The demos have helped immensely. Thank-you again for your help!!! Thank you for sharing this information it really helps beginners like me. I have just got a table easel that has the first angle as about 40 degrees (right after totally flat). I think that or even more angle will help me in acquiring better pre-drawing as have a feeling that I can see the paper from the right direction now (compared to totally flat). For painting I have not tried it but I expect that all you have described will apply. Hi Krisztian, Yes the steeper angle will make the drawing easier. It may make the painting a littler harder if you are not very experienced however. If you find the paint flowing too fast for you, just use a small box or something to support the easel top at a lower angle.